In the actual city of Valencia there are reasonably clean beaches such as, Playa las Arenas, in the area of Cabanyal and Malvarrosa. Malvarrosa beach is known as the city beach, however the other two are in walking proximity and all have stops on the tram. Malvarrosa beach is 1800 meters of light golden sand, with a width of 60 meters. It also has an adapted area for people with disabilities. There you can find a promenade of restaurants and bars that fit into the scenery rather than dominate it. This city beach also joins up with the America's CupPort, which contains mostly international bars and restaurants. After Malvarrosa it is Playa de las Arenas in Cabanyal, renowned for its famous paella restaurants. The beach stretches 1200 in length and 60 meters in width. Playa de las Arenas gets slightly more crowded than Malvarrosa due to the children’s playground. 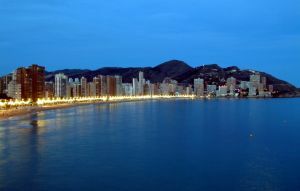 Throughout April – October this is one of the most popular nightlife areas in Valencia. The best beach, El Salér, is a little but further a field near Albufera Nature Reserve. It is 10km south of Valencia. This beach is 4900 meters long of exquisite golden sand with an average width of 35 meters. The wind during summer makes it a popular beach for windsurfing. Buses run every half hour in summer, and every hour afterwards. You can find more information on timetables at the bus station. Valencia’s main food market, Mercado Central is one of the oldest markets in Europe, with over 8 centuries of history; this place will never stop buzzing. The produce here is excellent and the building is worth a view in itself. Mercado de Los Hippis is a street market around the Mercado Central, in the backstreets of Plaza Merced. Open daily it is not highly recommended but you can find clothes and souvenirs. Mercadillo de Cabanyal is the largest street market in Valencia. Set in the authentic fisherman district of Cabanyal. Mercadillo de Ruzafa is a reasonably large street Market close to the centre, in a multi-ethnic neighbourhood. Here you can find mainly clothes, accessories and household items. This market takes place on Mondays, in the streets adjacent to the Mercado de Ruzafa (an indoor food market). Just beside the Mestalla Stadium (Valencia’s football stadium) is El Rastro – A Street Market that sells absolutely everything!It is said that many items are stolen but there are also honest traders too. Overall it is an excellent place to buy souvenirs, bicycles and almost any item on the planet, all awaiting a good hustler to bargain the price. El Rastro is open every Sunday. In Plaza Redonda there is a souvenir market open on Sundays, vending typical ceramics from this region but also random items. It is always bustling on Sundays. Valencia’s city is bursting with parks and without doubt the River Turia is the biggest stretching as far as the City of Sciences. This old riverbed was hollowed out and today it is a vast park almost circling the city centre, allowing cyclists and pedestrians to cross much of the city without the use of roads. Here everything is fresh and green, with lush grass, plant life, ponds and diverse bridges, old and modern that connects the student areas to the historical centre. Also many special one-off markets and live concerts are held in these parks.